Armor and underwater protection system of japanese battleship "Yamato" in 1945. Longitual armor protection on sides and under third deck. Note: armor thickness in milimiters "mm". For the secondary batteries, I have pics that show the 50 CNC + 25 DS barbette stops at the top deck. From the top deck down to the main 8" deck, just the tube is armored. I'm looking at saving weight in other designs and noticed that, not sure which is right but Iowa's 5/38 are only armored down one deck. Everything I found says the 6.1" guns have 0.98" (25 mm) armored turret (all sides and roof). There are some that show 50 mm of CNC right through the top center deck under the building section? Not sure if that would be correct because the bomb or shell has to smash through several levels of building before hitting the top deck, so having 50 mm of CNC here would be more or less a waste of weight. On the funnel some show just a small portion half way up at the front has the armor, and it comes around the sides a bit, maybe 20% on each side. Not sure if this is correct either. I found a pic of a break down at the boiler, it shows 22 + 25 side armor at the level just under the top deck, next level down shows a side armor of 25. For the belt this drawing shows 16 + 410 outer, 9 + 14 for the inner, torpedo belt (going from outside to in), 14 + 9/10 + 200-50 + 14 + 16 + 9. For the decks (top going down), top deck (outside edge), 20 + 18, second deck, 25, main deck, 6 + 230 + 16 + 9, fourth deck, 8. The Yamato/Mushashi 200 mm (230 mm at the sides) armored decks could not be penetrated. The 7 degree sloped sides doesn't help for shell impacts at long ranges but due to its thickness it doesn't make a difference. I think the sloped edge armor was used to help bounce off bombs, not so much for shells. 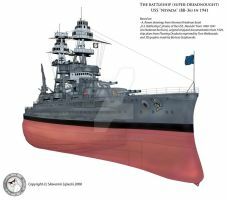 Considering Iowa had very little deck armor. The single layer stops shells if it is thick enough, the much thinner and numerous other deck layers are more for bombs. Iowa has good bomb decks but wouldn't take a hit from Yamato at 43,000+ yards. First of all - thanx. 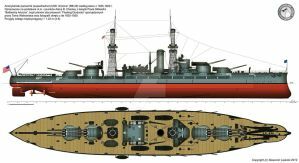 Iowa's main deck: 127 mm B + 32 mm STS (153 mm) - 147 mm B + 32 mm STS (179 mm) give almost the same protection as 200-230 mm MNC on Yamato class. The B class armor was unmatched in quality at the time of ww2. The hit from the distance of 43 000 yards (39 319 meters) was a total science fiction at the time, even for radar-directed fire from the "Iowa". Yamato has a top deck of 30-36 mm. mid deck of 25 mm, main deck of 200-230 mm + 10 mm and a splinter deck of 9 mm. I don't see how 159 - 179 mm gives the same protection. Iowa has upper deck of 38 mm STS, second deck of 159 - 179 mm, splinter deck of 16 mm STS and third deck (plunging-fire deck) 13 mm STS (25 mm STS near magazines). Its 226-258 mm however, its not an equivalent of single layer plate as well as on the Yamato. By the way, "Yamato" has 30-50 mm CKC upper deck only in front of turrets no 1 and no 3. Great and very accurate work! No, their deck armour was penetrated. It was just hard to hit the deck, 'cause most of it was taken up by guns and other equipment. Both should resist much more hits, if better designed.